If you’re like me, you address the issue of ocean plastic waste by participating in ocean beach cleanups. And you carry reusables as a way to cut down on single-use plastics. As much as these steps can help to reduce ocean plastic waste and give us all a good sense of satisfaction and accomplishment, they are just a start. I’ve discovered via a unique fellowship opportunity, that there are many more ways that we all need to, and can get involved in, addressing the real solutions to ocean plastic waste. I first learned about the problem of ocean plastic waste through my work educating residents for our local government in Perth, Western Australia. Visiting a Materials Recovery Facility where domestic recyclables are processed, my eyes were opened to the enormous volume of materials that need to be processed, and the complex and intense process that’s needed to sort and transport all of those materials or recycling. Unlike other materials, plastic recycling rates are low and plastic is usually downcycled rather than truly recycled. Much plastic originates on land in the form of single use disposables. 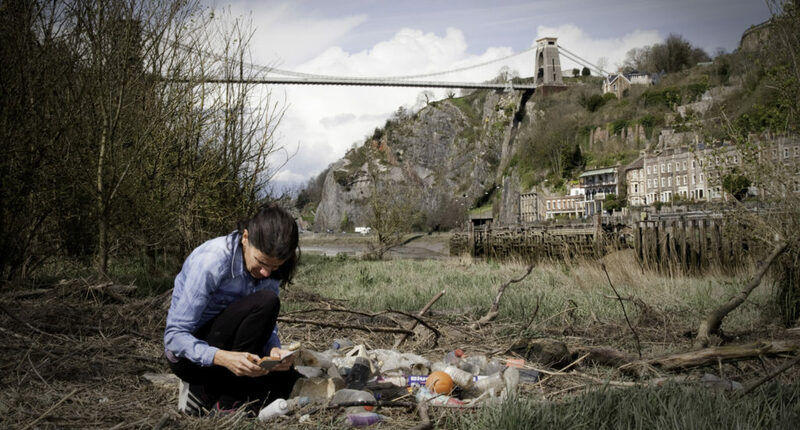 Six years ago, I founded the Plastic Free July challenge to raise awareness of the problems of single-use plastic and challenged people and communities to refuse it. In 2016 I undertook a Churchill Fellowship, spending two months to research innovative programs for raising awareness, managing and finding solutions to ocean plastic pollution. I wanted to better understand the issue, look at successful initiatives, and find out what’s missing. I explored beaches around Australia and sailed across the North Atlantic on a 72 foot yacht to see the problems of ocean plastic pollution first hand. The journey took me to the USA, UK, Netherlands and Hong Kong to meet with a range of individuals and organisations, including artists and bloggers to scientists, activists, educators, designers, policy makers and waste managers, including We Hate To Waste’s own Jacquie Ottman in New York! The Fellowship provided unique insight into how to address ocean plastic pollution. There is a multitude of innovative solutions to the problem. What’s missing: collaboration and sharing of these solutions to avoid duplication of effort and to amplify the impact. The volume of plastic production, the ubiquitous nature of disposable plastic and the habits of modern consumerism mean that the problem is larger than any one organisation or stakeholder. There is no one single solution to the plastic pollution problem. It will take a range of solutions across all three categories of collection, management and reduction, involving all stakeholders. Thus collaboration, and a connected approach which shares solutions, is required to avoid duplication of effort, to maximise impact and shift plastic material flows from the current linear system to a truly circular economy. 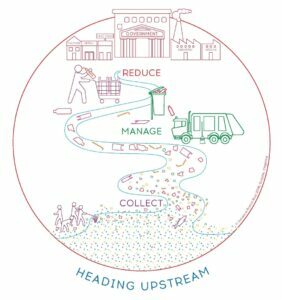 In order to share the breadth and depth of responses to the issue of plastic pollution, I developed the “Heading Upstream” diagram to create a framework for solutions. It contains three essential parts: Reduce, Manage, Collect. As a complement to cleaning up coastal ares and using reusables, we need to head upstream to reduce disposable plastics at the source. This requires strong government legislative reform and leadership. Product stewardship and extended producer responsibility are necessary to ensure that the cost of disposable plastics doesn’t remain a burden to the environment, communities and local authorities. It also requires collaboration between regulators and corporations including producers, manufacturers, designers and retailers who are responsible for making and selling the plastics that wind up in the ocean in the first place. Over 80% of ocean plastic waste originates from land, so having good waste management systems are essential and dealing with the litter issue is critical. Intentional littering is only part of the problem, for example our waste can become litter from overfull bins and lightweight plastics can easily blow away during transport and processing. Having litter control programs such as street sweeping and trash capture devices in stormwater drainage systems and waterways are important to prevent it from entering the oceans. During my Fellowship I spent two weeks in San Francisco, a city leading the way through a range of policies and initiatives working towards zero waste to landfill and zero trash to waterways. Plastic Ocean Pollution Solutions Youth Summit – empowering young people with information and tools to become advocates and changemakers. This three day conference in California brings together young people to work on their solutions to plastic pollution through a youth led, practical and supportive programme. A very impressive feature was a fully-catered conference of 150 people where there was no disposable plastic used! The focus on the problem of ocean plastic pollution needs to move beyond the beaches and reusables to the source and look at redesigning the system upstream. As individuals we cannot only make personal behavior change but can be part of the bigger picture by participating in some of these projects. After all – we are the consumers making purchasing choices and the citizens electing our governments. We all need to work together. Consumers, Government, Producers Retailers – we all can play a role. Alone we are a drop, together an ocean! Rebecca Prince-Ruiz is a Waste Educator with Perth’s Western Metropolitan Regional Council and founder of Plastic-free July. The 2015 Waste Champion Winner, Waste Authority of WA Infinity Awards, Rebecca is passionate about how we can all be part of the solution to the plastic pollution problem. In February 2016 Rebecca was awarded a Churchill Fellowship to investigate innovative programs of raising awareness, management and solutions to the plastic pollution problem. I love how this blog took a vast and intimidating problem and demonstrated approachable and achievable solutions. The ‘Heading Upstream’ Diagram is the perfect example of using simplified yet informative techniques to educate the public and therefore work towards collaboration. Shedding light on an environmental issue without being overwhelming and resulting in backlash is the key to fostering support and motivation to solve the problem, so I think the lay-out of this blog would work well for other important causes as well. As you mentioned, I am someone who carries reusables and participates in cleanups but feels at a loss about finding more ways to help, so I found this blog post to be educational and inspiring! Thanks! Many people are unaware of how pressing the issue of waste is. As someone who works in the food service industry, I know first-hand that restaurants have no obligation to recycle and in addition to that, are quite wasteful because it is more time efficient to do so. San Francisco’s ReThink Disposable’s initiative is a great incentive for restaurants to reduce their waste. There has also been a policy set in place commonly known as “Pay As You Throw”. This policy requires restaurants, corporations, residents, etc. to pay for their waste by the amount of the waste they are producing rather than charging at a flat rate. This gives consumers the incentive to reduce waste so they do not have to pay as much money. These facilities usually charge by the pound and has been used in California. Rebecca’ s fellowship and interest in Ocean Plastic Waste is admirable and I hope the government can be more pro-active in this area and implement waste management initiatives. Plastic debris kills marine mammals and degrades our coastal environments. The government should fund research and operations to regularly prevent and stop plastic waste disposal. Great job Rebecca!